Momus is the Greek god of satire. To me he is an obscure yet fascinating figure. You have to admire a minor god who gets kicked out of Olympus for constantly mocking the immortals. He calls Zeus a violent god and a horny womanizer, and tells Aphrodite that her sandals squeak and she talks too much. I always wanted to find the god of comedy, and it seems I’ve found him. Unfortunately, he has a dark side as well, being subject to accusations of unfair criticism and envy. He certainly sounds like a comedian. Sophocles, the famous Greek tragedian, wrote a satyr play called Momos, now almost entirely lost. Satyr plays “featured choruses of satyrs… and were rife with mock drunkenness, brazen sexuality (including phallic props), pranks, sight gags, and general merriment.” What fun! It’s nice to see that Sophocles can lighten the mood a bit and offer some bawdy, burlesque comedy. This is the same playwright who horrified us with the story of Oedipus, who if you recall, inadvertently murdered his father, married his mother, and stabbed his own eyes out. — from Aesop’s Fables, “Jupiter, Neptune, Minerva and Momus”; Collins Classics edition. Momus or Momos (μῶμος) was in Greek mythology the personification of satire, mockery, censure; a god of writers and poets; a spirit of evil-spirited blame and unfair criticism. His name is related to μομφή, meaning ‘blame’ or ‘censure’. He is depicted in classical art as lifting a mask from his face. — Wikipedia (the main source of information for this post). I do love you both together! Oh! The sweetness of the pain! All my thirst for sweet heart-ache! And my couch a low grass tomb. Keats opens with a misquotation from Milton’s Paradise Lost. The scene is from Book II, lines 899-901. Satan confronts Sin and Death, who guard the Gates of Hell, only to find that Sin is his daughter, and Death is his son. After Sin unlocks the nine gates, they gaze upon Chaos, depicted as a roiling, clashing mix of elements. “Lethe’s weed, and Hermes’ feather” — “The contrast is between dull obliviousness and mercurial sharpness” – Oxford World’s Classics edition footnote. Hermes is the swift and clever messenger of the gods in Greek mythology (known as Mercury by the Romans). wood-bine –commonly called honeysuckle; a flowering plant. Momus — God of Satire. Momus is so interesting that I’m going to have to post about him. I defy you, dear reader, to find one poem by a major poet — one poem — that celebrates lifelong monogamy. Hallmark anniversary cards do not count. Why is there such a yawning void when it comes poems addressing this subject? Perhaps because poets understand the transitory nature of love more fully than most. Poets celebrate love, not love’s longevity. Poetry will help you woo your woman, but after that… good luck. Please understand, I support marriage, as I support modern civilization. That doesn’t mean it isn’t problematical for a whole host of reasons. And I’m not a complete cynic. When I see old couples dancing, it makes me believe. Couples can love each other, with mutual respect, with rewarding emotional initimacy and affection, for many years. But love — passion and giddiness — you’re not going to retain. The best you can hope for is a warm glow that flares up now and again on rare occasions — and that’s if you’re compatible and properly devoted. 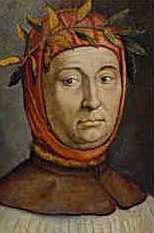 Coming soon… who is Petrarch? Childe Harold’s Pilgrimage continues… Spain is beset by war, and Harold is on his way to Seville (Sevilla). I recommend first reading the stanzas and going back a second time to enjoy my excessive commentary. Yet is she free? the Spoiler’s wished-for prey! Blackening her lovely domes with traces rude. Ilion = Ilos was the founder of Illium or Illion, also known as Troy, which of course was destroyed by the Greeks. Tyre = An ancient seaport. Despite being an island city fortified with walls, Alexander the Great managed to conquer it in a siege in 332 B.C. He built a causeway allowing him to bring his catapults (ballistas) within firing range. Still to the last kind Vice clings to the tott’ring walls. I’m sure other egregious anecdotes from history can attest to this unfortunate phenomenon: elites party while their countrymen die in war. 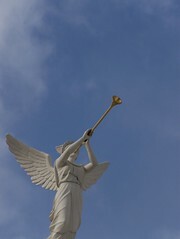 clarion = a clarion is a medieval trumpet. As the familiar adjective, it means: “brilliantly clear <her clarion top notes>; also : loud and clear <a clarion call to action>. rebeck = a rebeck or rebec is a medieval, three-stringed instrument. See angel. Blasted below the dun hot breath of War. The hoarse dull drum would sleep, and Man be happy yet! “the dun hot breath of War” – Dun is a word not commonly heard in the United States. It has several meanings, but to dun is to demand payment, in a persistent, pestering way. My guess is that here dun means pestering / plaguing; in the sense that war constantly demands payment in lives. Fandango = a Spanish dance, here personified. The dance is accompanied by guitars and castanets. How carols now the lusty muleteer? His quick bells wildly jingling on the way? And gore-faced Treason sprung from her adulterate joy. Viva La Rey = “Long Live the King” / King Ferdinand the VII. I’m going to have to leave it there for now, owing to the fact that developments in the Peninsular War are more complicated that I expected. I need to do a little more research.